From Vicki Quade, the creator of the popular comedy Late Nite Catechism, comes the new interactive comedy Bible Bingo. The Archdiocese's new bingo department needs to raise money for the parish. That's where you come in: Get ready to play bingo for a variety of wacky prizes. Along the way, you'll be drawn into conversation about everything from Adam and Eve to modern sins. Just be careful: You might laugh so hard you forget to yell "bingo." "...Church bingo fund-raiser Mrs. O'Brien is full of salty-nun severity and some refreshing snark, welcoming audience-member squirms elicited by talk of religion on date night. As one-half of the token Jewish couple and unlikely winner of the first round of bingo, I got more attention and Catholic prizes than I'd prayed for-and promptly traded my Bible eraser for another winner's mini Torah. (Don't tell Mrs. O'Brien!)" "...This show isn’t high art, nor does it need to be. I’m pretty sure if it were, I wouldn’t want to see it again. Instead, I expect that I’ll go back at some point when not wearing my critic hat, just to have a good time." 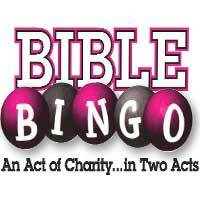 "...For a fun night out go to Bible Bingo the more the merrier, oh and there is a beer bash (bar) in the back of the room as well! This would be a fun family outing too, bring Mom, Grandma, and Aunt Pat they will find it to be a hoot!" "...In the tradition of most interactive shows and every Catholic school, latecomers are called out; some are even asked to give a dollar to charity, which Quade gladly accepts. Through collections and performances, Quade and her company have raised more than $2 million for various orders of nuns around the world. So, although some of the humor may make some folks a bit uncomfortable, it’s fair to say the premise of the show can leave audience members of any age and religion feeling like winners. Isn’t that what a good game of bingo is all about?"